The SolarSystem 550 is a game changer in indoor and greenhouse lighting for horticulture. The SS 550 is compact and lightweight yet puts out more light than much larger LED grow lights and will replace a 600 watt HPS system. Powerful enough for veg or bloom, the SS 550 features fully programmable spectrum control with the optional Solarsystem Controller. Linked together in a series the SS 550 can cover any size grow area large or small while drastically cutting energy usage and eliminating the need to change bulbs ever. Plug and play design with no external ballasts or ducting makes installation a simple one-person job. Small foot print limits the shadow effect in greenhouses but covers a large canopy area. High power output and low heat is perfect for large indoor grow operations. Time to replace older inefficient fixed spectrum lighting systems. Programmable spectrum control for best results in all phases of growth (SolarSystem Controller required for this, controller not included). Covers a 3 X 4 area in bloom and up to 6 X 8 area in veg. High Power Osram LEDs 400 watts actual draw at full power. Optimal spectrum for both veg and bloom. 50,000 hour LEDs Never change bulbs again. Low heat output No ducting required. High performance custom LED drivers. 50,000-hour water resistant fans. Automatic voltage regulation 90 277 volts. Lightweight and easy to install only 13 pounds. Robust design made in California. Local support and grow room design. 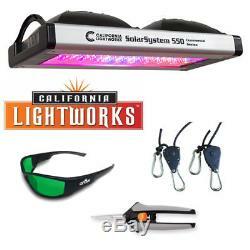 The item "550W SolarSystem LED Panel by California Lightworks Grow Light Fixture + Gifts" is in sale since Thursday, March 8, 2018. This item is in the category "Home & Garden\Yard, Garden & Outdoor Living\Gardening Supplies\Hydroponics & Seed Starting\Grow Light Kits". The seller is "ashl_mcph" and is located in Fort Collins, Colorado. This item can be shipped to United States, Canada, United Kingdom, Denmark, Romania, Slovakia, Bulgaria, Czech republic, Finland, Hungary, Latvia, Lithuania, Malta, Estonia, Australia, Greece, Portugal, Cyprus, Slovenia, Japan, China, Sweden, South Korea, Indonesia, Taiwan, South africa, Thailand, Belgium, France, Hong Kong, Ireland, Netherlands, Poland, Spain, Italy, Germany, Austria, Israel, Mexico, New Zealand, Singapore, Switzerland, Norway, Saudi arabia, Ukraine, United arab emirates, Qatar, Kuwait, Bahrain, Croatia, Malaysia, Brazil, Chile, Colombia, Costa rica, Panama, Trinidad and tobago, Guatemala, Honduras, Jamaica.